It's tough to be a bug, and tougher yet to be a bug in the sweeping popularity of modern-day superheroes. Disneyland Resort announced in March that "a bug's land" will close permanently to make way for a Marvel Land, a superhero-themed area paying homage to Captain America, Black Panther, Thor, and characters from the Marvel Cinematic Universe (MCU) which Disney also owns. I helped open Disney California Adventure Park in 2001 before "a bug's land" was even a concept. The park was California-themed then, divided into Sun Plaza, Paradise Pier, Condor Flats/Grizzly Peak, Hollywood Land, and Golden State, which highlighted the agricultural aspect of California. Straight from Walt Disney World's Animal Kingdom, It's Tough to be a Bug was one of the original attractions set in the Golden State area. Not long after the park opened, Disneyland executives realized West Coast guests were not accustomed to multiple theme parks and expected the new location to replicate Disneyland — meaning characters and kids' attractions. Disney teams quickly altered the theming to depict Mickey, Minnie and friends vacationing in the theme park complete with tourist clothing and cameras. And, for the smaller guests, "a bug's land" was hatched. Pixar's A Bug's Life is certainly not the most popular of Pixar's releases, and in fact, is usually near the bottom of any Pixar feature list. But Disney needed a quick fix and branded the newly released film to fit the theme park. After a few months of growing pains, the land became a favorite for families to enjoy together repeatedly. Flik's Fair was the precursor to "a bug's land," which opened in 2002 with four new attractions aimed at the younger guests. The backstory was such that Flik and his friends opted to open a fair as the park was under construction. Disney Imagineers discovered the entertaining venue and shared it with the public. Flik's Flyers, Francis' Ladybug Boogie, Tuck and Roll's Drive 'Em Buggies, and Heimlich's Chew-Chew (the best!) debuted along with a splash zone — Dot's Puddle Park — to eager visitors. The new area was set adjacent to It's Tough to be a Bug for a perfect segue from the Golden State area. Wanna-be bugs enter the land through a Toy Story 2 Cowboy Crunchies cereal box (complete with cut-outs) into a life-size world where guests become the insects. Towering blades of grass and lightning-bug lightpoles line the winding path throughout the land. Human visitors wanting to relax can sit down on benches made from fruit-stained popsicle sticks. No need to worry about getting popsicle stains on your clothes. These benches are stain-free. Photo by Todd Pickering. The splash zone, or Dot's Puddle Park, welcomes guests to Flik's Fair. Simulating the image of being a bug amid garden tools and a spraying hose, this soak zone has been a reprieve for families needing a break, especially on those steaming summer Southern California days. I'd say Dot's Puddle Park is more a soak zone, than splash area because kids usually find a way to get as wet as possible — especially waiting for the water shots to burst up from the ground. Like most parents who have visited "a bug's land," I learned quickly to pack extra clothing for my kids. You don't have to be bug-sized to feel refreshed at Dot's Puddle Park. Photo courtesy of Michaelle Zumaya. 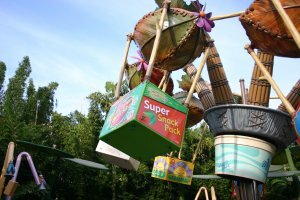 Flik's Flyers is a spinner ride where guests board a balloon contraption fashioned from old food containers, leaves and anything else a bug could find. Being the inventive ant he is, Flik rounded up empty circus cookie boxes, raisin boxes, and even Chinese food take-out containers to help create his balloons. And, of course, our favorite ant is the emcee of the attraction to ensure riders follow the safety rules as every bug should. Next door, ladybug Francis, hosts a rock-n-roll session on Francis' Ladybug Boogie in which visitors ride in Francis ladybug cars rotating on a figure-8 circuit. Francis is apparently a jazz enthusiast as toe-tapping tunes sound out during each ride segment. And, kids of all sizes can board Tuck and Roll's Drive 'Em Buggies for a smashing good time (but no actual bug smashing). These bumper cars are always a popular attraction although I'll venture a guess that most parents who have surrendered to the wanting child, have been a bit stiff after getting out of the cars, me included. Those buggies are definitely bug-sized! Watch out for bugged-out drivers in the bumper car favorite! Photo courtesy of Michaelle Zumaya. Saving the best for last, Disney hit the web bullseye with the debut of Heimlich's Chew-Chew. The German-accented caterpillar who dreamed of becoming "a beautiful butterfly" conducts his own train tour around a garden of half-eaten food (presumably his) including his favorite candy corn. This was one of my favorites to ride with my son when he was little. The bright colors and Heimlich's silliness as he talks lovingly about his food, is a delight for the smallest of guests. This attraction will be missed by many. Heimlich pulls along his visiting pests, er guests, into his garden of edible favorites. Photo courtesy of Michaelle Zumaya. The Marvel-themed land is set to assemble in 2020 with Guardians of the Galaxy: Mission Breakout! as the anchor or E-ticket attraction. Other rumored attractions include a possible Avengers compound and Doctor Strange's Sanctum Sanctorum, but, knowing Disney, plans change. Character meet-and-greets will most like be moved from Hollywood Land over to the new superhero home, but for now, guests can still get a photo with Captain America or hang around with Spiderman. And so we say good-bye to our favorite insects, spiders, and bugs. It's Tough to be a Bug has performed its final show and is now permanently closed. The rest of "a bug's land" flies away September 4, in just a few short weeks. But a part of the land will remain in Pixar Pier says sources. It looks like Flik's Flyers will be repurposed as Inside Out Emotional Whirlwind, set to debut sometime next year. And never underestimate the creativity of Disney Imagineers. With every new attraction that pops up, a little bit of Disneyland history is usually hidden somewhere waiting for guests to spy. (Country Bear Jamboree has several past characters hidden throughout the Resort. Max, Buff, and Melvin are still hanging around in their old location which is now The Many Adventures of Winnie-the-Pooh. And, Terrence the Bear's octopus love from the song "Two Different Worlds" is among several artifacts lining the queue for Guardians of the Galaxy: Mission Breakout! in Disney California Adventure). Here's hoping Imagineers continue the fun tradition. A few historical corrections for you: "Sun Plaza" was never a name used in DCA (it was "Sunshine Plaza"); what is now Hollywood Land was Hollywood Pictures Backlot when the park opened; and the park was originally divided into four Districts: the aforementioned Backlot, Golden State District (which included numerous sub-areas like Condor Flats and Bountiful Valley Farm), Paradise Pier, and Entry Plaza. NNTTM. This article made me so sad. Heimlich is my daughters very favorite ride. I will never forget all of her giggles each time we rode it. I took some pretty extensive video on our last trip since I knew we wouldn't be able to go see Bugs Land again before it was gone. I loved reading this even though it made me sad. Thank you! Thanks for reading. A lot of parents of littles who visited A Bug's Land feel the same. This is still really bothersome for me. It was the first and only place I like about DCA when we first went in 2006. Ever since, it's been a favorite of my kids. Heimlich will be the biggest loss. The kids always loved the burps and all his funny quips. I wish they would've extended the boundaries of the park to add Marvel Land. All they did was eliminate a kid area for probably less overall rides. But money is money, and kids don't scream to go to Bug's land, but twenty-somethings will pay big to ride the new Marvel rides. Still, they could've kept this area. Good riddance. The only attraction I liked was It's Tough to Be a Bug which still exists at DAK.